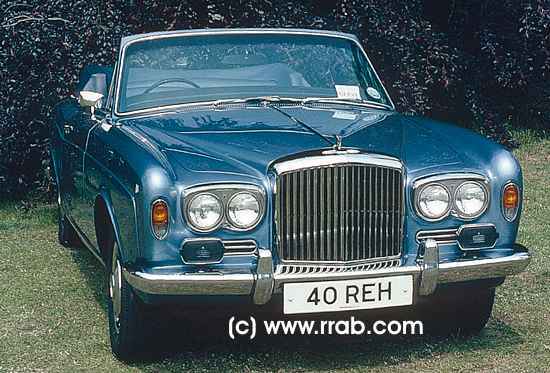 Bentley Corniche, Mulliner Park Ward Drophead Coupé, 1973, #DBH14661. No more appropriately than for the Bentley Corniche with its "Winged B" radiator motif could have been chosen the slogan "When nothing stands between you and the open sky, it is as if the wheels were wings". Though the origin of the coachwork of this model could be traced to the basic model Bentley T due to its superbly executed lines the Bentley Corniche had particular charme of its own. It was priced in class of its own too - though to mention the subject of coin was considered as being nqoc* by those fortunate enough to own one The coachbuilt models were the first to feature technical innovations like ventilated disc brakes or breakerless electronic ignition. The Bentley Corniche was re-christened Bentley Continental in 1984. Bentley Corniche, 1973, #CBX15369, Mulliner Park Ward Saloon. Rolls-Royce designation was "Two Door Saloon" for what many considered to be a Fixed Head Coupé.